Last week on Today on STV, Josephine Effah-Chukwuma, the Executive Director of Project Alert on Violence Against Women appeared on the show to talk about Project Alert’s 10th year anniversary. With her were the organisation’s ambassadors: actresses Kate Henshaw-Nuttal; Stella Damasus-Nzeribe, and Susan Harvey. This might be many people’s first time hearing about the organisation, although they have been in existence for a decade now. In that time, they have provided shelter for 580 women and children in Sophia’s Place, a shelter for women who are victims of gender-based violence. Project Alert also provides counselling, legal aid and skill acquisition. In recounting some of the highlights in the fight against VAW (violence against women), Ms. Effah-Chukwuma talked about Lagos State’s Domestic Violence Law of 2007, which among other things allows people to take a protection order against VAW victims other than themselves, e.g. neighbours, relatives, friends. Project Alert has also been working on training members of the police to respond in more effective and empathetic ways to reports of violence. During the course of the conversation, Kate Henshaw-Nuttal opined that women have low self-esteem, which is largely why they are victims of violence. Well, I feel that while many women have been raised to believe that we live in a man’s world, this is an extremely sweeping generalization of all women. Stella Damasus-Nzeribe believed that this violence is encouraged because boys are treated better than girls, with girls having to defer to the boys and men in their lives (even if this boy is their younger brother). Susan Harvey spoke about the need to create awareness and raise funds for Sophia’s Place. Indeed, their 10th year anniversary celebrations will include a fund-raising event to raise money to buy an apartment in a quiet, secluded place. More information or to find out how you can help, visit the Project Alert website (www.projectalertnig.org) or contact Silverbird TV. I had such fun last weekend. I participated in a charity walk to raise money for breast cancer prevention. A Run Towards the Cure was organised by Children Survival and Development of Nigeria (a nonprofit organization founded by Mrs. Onari Duke) and The American International School of Lagos, in conjunction with the Passionately Pink program through the Susan G. Komen foundation (a U.S. based foundation that has made historic gains in the fight against breast cancer). I love walking (one of my secondary school nicknames was Miss Waka About) and combining it with a charitable goal is even better. I am vaguely familiar with the breast cancer walk organised by the Susan G. Komen Foundation in the States, and I remember it as being a 3-day walk (problem number 1) for which you had to raise a minimum of $1,000 (problem number 2). I never participated. When my friend and Pilates instructor mentioned that she was putting together a team for the Run Towards the Cure, I hesitated because I DO NOT RUN. After she assured me that she would be walking, I agreed to. Getting out of the house at 7am on a Saturday morning was not the big deterrent for as many people as I expected. The start point of the walk, American International School, was teeming with enthusiastic walkers. I also expected since breast cancer predominantly affects women (yes, a few men suffer from breast cancer too! ), most of the runners/walkers would be women. And perhaps this was the case, but there was an unexpectedly high number of men and children taking part. ... based on the 'un-conference' style of similar Bar Camps, like those in Kenya, Tanzania. An un-conference is an informal gathering of professionals and enthusiasts for a period of learning and sharing. It differs from the typical conference where information generally flows from presenters to participants, and rather takes a more participatory approach. For more info, subscribe to the Twitter updates: twitter.com/barcampnigeria. One of the things I promised to do this year was to read more ..... wait! Don't I make that resolution every year? Perhaps. Anyway, with much excitement I finished my latest read This Charming Man by Marian Keyes. This was not a difficult read by any means, but those usual demons of no time, misplaced priorities (read: too much time spent aimlessly surfing) and no time reared their ugly heads. And I had selected this book, because I figured that light-hearted reading was the perfect antidote to a schedule bursting with other activities. Well, to an extent, it was. It was very easy and engaging reading that I had no problem picking off where I left off - even after not reading it for over a week. Like most bestsellers, it was a page-turner and I was hooked into the storyline from the first chapter. A couple of years ago, I worried about my new-found interest in chick lit at the expense of my more serious books. I don't worry about that anymore; I'm just enjoying reading more regularly. And besides, I'm reading a lot more for work, so I suppose there is some kind of diversity. Now, I'm reading a Christian romance - What a Girl Wants by Kristin Billerbeck. The first one I read a few years ago, Boaz Brown by Michelle Stimpson was quite good - unexpectedly so. So, I'm hoping this one is a good read. This unprecedented event, backed by the Government, gives the bloggers and their audience the chance to engage with and influence world leaders on issues including development, climate change and women's rights. The bloggers were nominated by the public, with more than 700 nominations received in 12 days. www.g20voice.org with audio and video livestreaming, and also via Skype broadcasts from inside the summit. Adrian Lovett, Director of Campaigns at Save the Children said: "G20Voice will tear back the curtain as leaders draw up their blueprint for global recovery. Thanks to G20Voice at this summit the world will be watching. Bloggers will witness the summit from the inside - and the world will know whether leaders are building a future fit for the world's children, or one that rewards only the rich. Gordon Brown has set the bar for the London G20 summit next month by promising that the UK will meet its aid commitments despite the economic downturn. He must ensure other G20 countries do the same. If action to prevent children dying isn't taken now we could see this financial crisis claim the lives of a generation of children." Oliver Buston, Europe Director of the Africa campaign group ONE said: "At ONE we’ve always been focused on empowering individuals to raise their voices against extreme poverty. This group of citizen-journalists includes some of the most articulate voices on this issue, and it’s exciting to be a part of bringing them to this international stage. The world’s poorest people are being hit hardest by a global crisis not of their making – the bloggers will have a chance to ask tough questions of world leaders, and demand solutions that will benefit everyone, not just the wealthy few." The G-20 (more formally, the Group of Twenty Finance Ministers and Central Bank Governors) is a group of finance ministers and central bank governors from 20 economies: 19 of the world's largest national economies, plus the European Union (EU). The G-20 is a forum for cooperation and consultation on matters pertaining to the international financial system. It studies, reviews, and promotes discussion among key industrial and emerging market countries of policy issues pertaining to the promotion of international financial stability, and seeks to address issues that go beyond the responsibilities of any one organization. Like I need more time-wasters in my life. I was led to Heidi, Geek Girl Detective via someone I follow on Twitter (*now* I'm starting to see the benefits of Twitter). 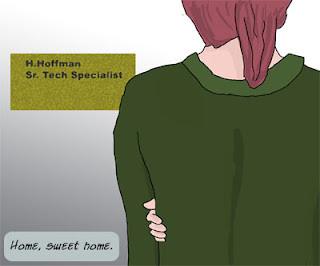 Heidi is a techie in a mid-size bank somewhere in the United States and these comics are all about her adventures. I'm still on the first story, but so far it's hilarious. I remember when I worked at the NGO in Boston. Sometimes I would be in the I.T. department attending to my computer problems as calls came in from other employees. The I.T. staff was generally nice, but if the problem being reported was deemed stupid, snarky remarks would follow the call. And if the question was deemed *incredibly* stupid, they might never pick up calls from that employee ...ever! Okay, no seriously they would, but perhaps not before trying to ignore the call for as long as possible. LOL!!!!!! Heidi, Geek Girl Detective reminds me of that world. Are you teaching anyone to blog or planning to? If you are, you will find these resources helpful: How (and how not) to teach blogging; and How to Grow a Blog. Yes, setting-up a blog is easy, but maintaining it for the long haul is not a walk in the park. I have been teaching some people how to blog. The first issue you have to address before teaching someone to do something is why they would want to do it. I cast my mind back to school where I would always be taught the how before the why. But the time we got to the why, I really could give a damn. Teaching itself is basically very hard and doing it well is both a science (because there are steps that must be taken to break down knowledge and share it in a way that makes sense to the students) and an art (because it is also a gift that some people are just born with and every good teacher has their particular style). No, I didn't get the opportunity myself. Wouldn't that have been the day. I found a great interview with the actor Idris Elba on an NPR Fresh Air podcast. About the first half of the interview focuses on his new TV role on the show The Office (US edition). The rest of the interview explores his role as Stringer Bell on my fav show The Wire and his music career. Check out the interview. There's also a link to a profile on the actor in the Guardian, dated March 2008. Today is Ada Lovelace Day, which is an international day of blogging to draw attention to women excelling in technology. And to celebrate the day, I'm blogging about women in technology who have influenced me in some way. It's especially important to celebrate the achievements of women, because research shows that having role models and mentors greatly motivates younger women seeking to participate more in technology. Now what does being "in technology" mean? It could be as varied as working as a programmer to a database developer to a researcher to a vendor and even to a writer. Over the last few decade or so, I have been fortunate to meet several women who I have learnt from or been inspired by in some way. And initially, I was going to attempt to write about all of them, but that plan is a little ambitious for now, so I have selected the woman who was one of my earliest guiding lights, who gave me an idea of the realms of possibilities, which existed for me. She is Dr. Nancy Hafkin. I was introduced to her when I was job-hunting in the U.S. This was in 2001 and it was a particularly bad time to look for a job, because a few months before the dot-com bubble had burst, which resulted in the folding up of many internet-based companies and the loss of many information technology jobs. I was given Ms. Hafkin's number because she was considered to be very knowledgeable about the gender and technology cross-discipline. I had not heard of her then, but I Googled her, as was my practice. I was so impressed and rather awed by what I read. Nancy Hafkin led the research on ICT for development (information and communication technologies) and gender and ICT issues since the early 1980s. She had worked on the African continent on ICT4D issues for approximately 20 years, including positions at the UN and the Economic Commission of Africa. However she had recently returned to the Boston area. When I got in touch, by email and then phone, she was extremely warm and helpful. She asked me about my interests and shared advice on organisations to try and people to get in touch with. I was particularly humbled because coming from Nigeria, I know all about the "Big Man/Woman Syndrome" where you could not get audience with most accomplished or influential people without going through layers of protocol first and despite that, still having to deal with a patently dismissive attitude from said person. A couple of months later when I got a job offer, I emailed Ms. Hafkin to share the news with her. It was about four years later at a conference I attended just before moving back to Lagos that I finally met her face-to-face. She was one of the speakers and I could not wait to introduce myself to her after the panel. I started off "You don't know me, but I am ....."
I was stunned and bowled over. "How did you know? I stammered. She smiled. "I just knew." She was thrilled to hear that I was moving back home (one of the few who didn't immediately assume that I was having visa problems or being deported). When I mentioned in an off-hand manner that I was thinking about getting a PhD but was not so sure anymore, she beamed and encouraged me to do it. Then, she reeled off a list of Ivy League schools that she thought I should apply to. "Hmmm, this lady really thinks A WHOLE LOT of me. Ivy League? I don't know about that...."
Shortly after the conference, I moved back home and haven't had the opportunity to see her again. However, her encouraging words, accomplishments and her spirit left an indelible impression on me and have propelled me on in my career choices ever since. I remember when I was thinking about topics for my Masters degree thesis and after dancing around various subjects, circled in on women and IT. I wasn't quite sure if it was a viable area for exploration and it certainly didn't have that ring of prestige that some of my colleague's topics did. I wasn't sure where it would lead, if truth be told aside from a vague plan that I would "work with women and girls" in a role where technology met society. However, now because of women like Dr. Nancy Hafkin, I feel like I made a series of alright choices after all. While her work is about technology, it is centered on the people who use the technology: how they use it, how they can use it more efficiently and also on the people who are not using the technology: why not, what technology has to offer them and how user challenges can be addressed. This has been a good guide for me and I know because she was helped pioneer a new field, I'll be better than okay doing something unconventional, as long as it is something I feel called to do. The BBC World Service is offering citizen journalists equipment and training for its "Your Story" project, as well as the chance to have their content featured on major BBC news programs. Your Story is the BBC World Service's citizen journalism project, running since June 2008. Anyone can send in ideas for stories and news reports, or personal stories, photos, audio and video. Through the program, BBC broadcast journalists work with individuals to pursue report ideas and will provide them with recording equipment, training and advice. Some of the generated content ends up online, while some goes on air and may be broadcast on major BBC news programs such as the Newshour and the World Today. For more information visit the Journalism.co.uk website. I've been having computer issues. My laptop almost from the time I got it has intermittently had problems booting up. Sometimes it starts and sometimes it freezes and I have to restart it. Eventually, things got to a head and the hard drive had to be replaced. I thought it was okay, but after all that, it still hung this evening. I don't know about these HPs... The new Pavilion models look cute and all, but it's unnerving to have such an unreliable computer. My last HP wasn't great either, though maybe I just used it a little past it's sell-by date. I think my next computer will be an Apple. Two weeks ago I met Josephine Nzerem, founder of Human Angle. I found her to be an extremely passionate woman, especially about protecting the rights of women notably in the area of widowhood rites. Then, yesterday I came across this interview with her on the Social Edge website. You can browse both the Social Edge and YouTube sites for more inspiring interviews. In the spirit of this wonderful arts month, here's another entry for your calendars. A friend of mine, D. Gilbert Sagay Diete-Spiff is showing his latest collection of knife paintings (i.e. paintings created with knives, NOT paintings of knives). The exhibition, which is entitled Times & Seasons opens on Sunday, March 15 at 3:30PM and runs until the 19th. There's a workshop on the 16th and 17th (by invitation only). There are quite a number of things happening this month. Wole Soyinka's "The Swamp Dwellers"
The National Theatre and the National Troupe of Nigeria present Wole Soyinka's The Swamp Dwellers, directed by Nick Monu. Soyinka's first major play was first published in 1958 and is a combination of European drama tradition and Yoruba culture. The Lagos Jazz Festival, featuring concerts, jam sessions, exhibitions, get togethers and music master classes, which will be staged at different venues in Lagos. 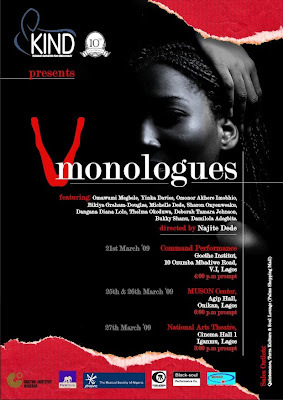 To celebrate the International Women's Day, Kudirat Initiative for Democracy (KIND) - www.kind.org - presents V Monologues: The Nigerian Story, a play based on interviews from 150 women from all over the country. The aim of the play is to raise awareness on violence against women and girls in our society. The gate fee will be donated to charity. Read my post on last year's performance.